Author/Opus: This is the 1st puzzle from guest contributor Fatih Kamer Anda. Rules: Standard Consecutive Sudoku rules. Insert a number from 1 to 9 into each cell so that no number repeats in any row, column, or bold region). 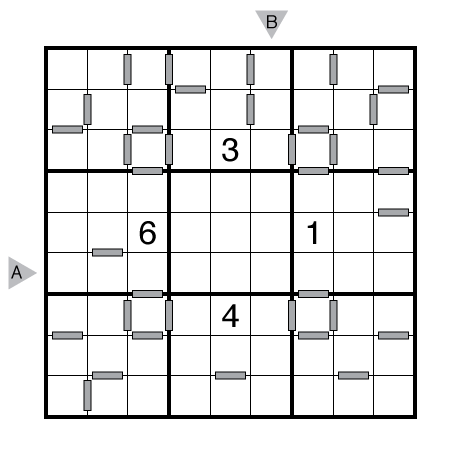 Some bars are in the grid; any two adjacent digits separated by a bar must be consecutive (i.e., differ by 1). All adjacent digits not separated by a bar cannot be consecutive. Answer String: Enter the 6th row from left to right, followed by a comma, followed by the 9th column from top to bottom. 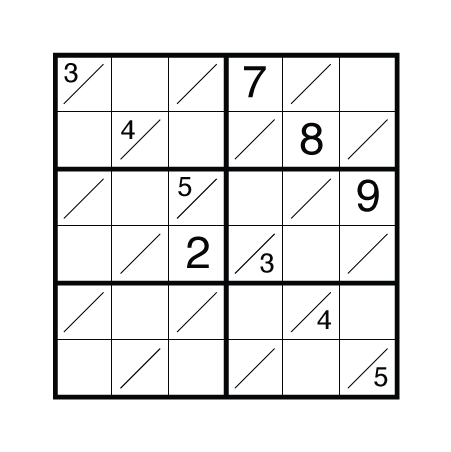 Note: Follow this link for other Consecutive Sudoku. 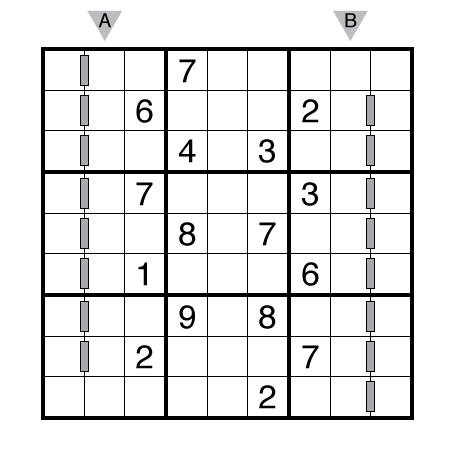 If you are new to this puzzle type, here are our easiest Consecutive Sudoku to get started on. Author/Opus: This is the 228th puzzle from Thomas Snyder, aka Dr. Sudoku. 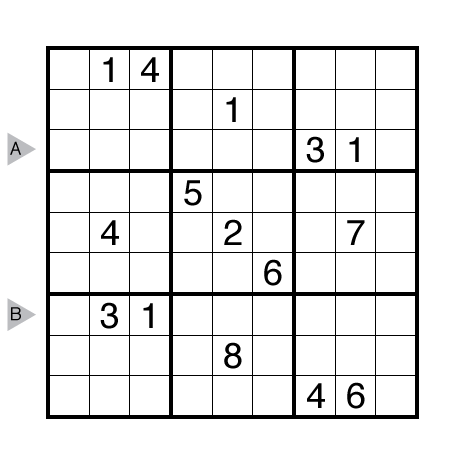 Rules: Standard Consecutive Sudoku rules. 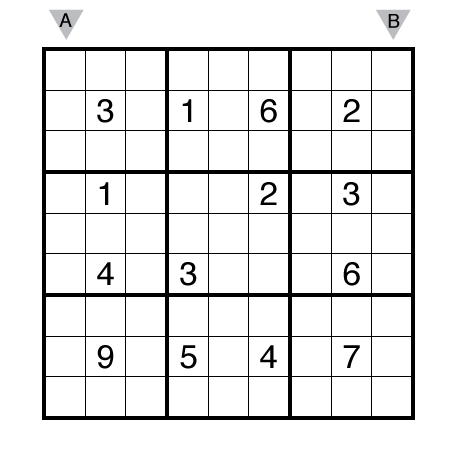 Since there are no bars in this grid, this should be considered a Non-Consecutive Sudoku. 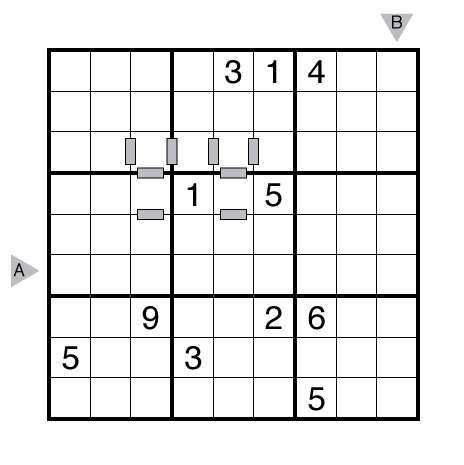 Author/Opus: This is the 4th puzzle from guest contributor Craig Kasper, who has recently started a new blog about puzzles. 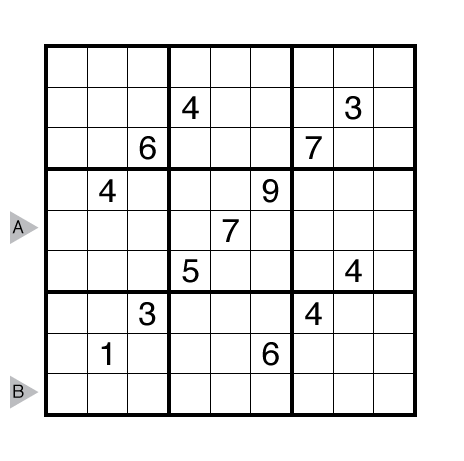 Rules: Standard Consecutive Sudoku rules. Answer String: Enter the 6th row from left to right, followed by a comma, followed by the 6th column from top to bottom. Theme: Primarily logic, with today’s date hidden as well. 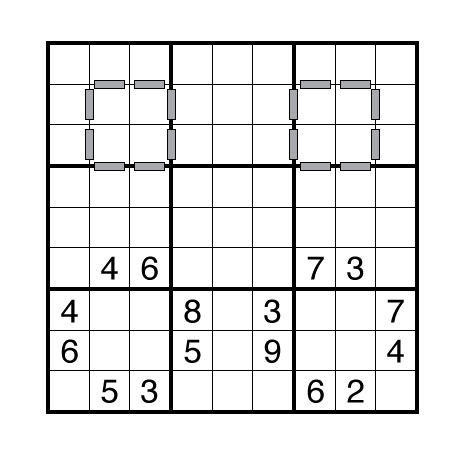 Author/Opus: This is the 157th puzzle from Thomas Snyder, aka Dr. Sudoku. Answer String: Enter the 3rd row from left to right, followed by a comma, followed by the 7th row from left to right. Two more from the US Sudoku Qualifying Test in May — both are styles I’ve constructed a lot of in the past and will likely continue to construct a lot of in the future as they are both pretty simple variations that add more properties of the numbers into the logic of sudoku and enrich the solving experience. I went for a lot of less common symmetry types with this test (diagonal or mirror symmetries instead of 180 degree rotational) and both of these themes showcase one of those less common types. With Tight Fit, the diagonal symmetry works well with the added slashes forming their own diagonals parallel to the mirror plane. The solve was meant to fairly easy, but the sparsity of starting digits here actually leads to a rather large cycle to place two of the highest digits remaining towards the end of the puzzle. This trait pulled it towards the top of my pile of Tight Fit to include here. For the Consecutive Sudoku, I’ve been doing a fair bit of half consecutive/half non-consecutive exploration recently (such as this earlier GMPuzzles one). And I’ve played with 2×2 box shapes with consecutive bars before too, such as here. Well, it turns out that there are no puzzles possible that have just the 2×2 box shapes in opposite corners as in the second linked puzzle without additional bars elsewhere. But there are a whopping 4 possible solutions with the repeated top boxes and no other bars as here (and 2 of those 4 are trivial copies from a 1-9 to 9-1 swap). It was from that small set of potential solutions that I crafted this puzzle. Using a given presentation that evokes the same kind of bars as up top seemed best and gave the solving properties I wanted. But if you’d like an extra hard challenge different from this one, put a single 1 in the lower-left corner and try to solve from there. As I’ve discussed before, the non-consecutive constraint is really powerful and constraining in ways you wouldn’t expect but it always needs some hands-on work to cultivate a fun and approachable puzzle. Both of these puzzle are probably on the easier end for this test, but both are good representations of the new logic that arises from the variation. As “extras” from the first Grandmaster Puzzles construction cycle, it seems fitting to get them both up here now. Rules: Standard Tight Fit Sudoku rules. Range is 1-9. Theme: Boxes of two sorts. Answer String: Enter the 1st column from top to bottom, followed by a comma, followed by the 9th column from top to bottom. Answer String: Enter the 2nd column from top to bottom, followed by a comma, followed by the 8th column from top to bottom.